When Attention To Detail Is Important To You, There's One Company To Choose: Zion Stone Marble. Why Not Invest In New Flooring? You Know, It's Not As Expensive As You Think. It's Simple, In A Blink Of An Eye, You'll Have Brand New, Shiny, Modern Flooring. Hi, my name is Gilbert Cruz and I am the owner of Zion Stone and Marble Corp. Since 2000, my team and I have set thousands of square footage of ceramic tile, marble, porcelain, or any stone. You name it. Hi, I am Gilbert Cruz. I am the owner of Zion Stone And Marble. When you are looking for a professional with more than 10 years in the tile industry, with hundreds of highly satisfied customers, you have one company to choose from. And that is Zion Stone and Marble. The services that you will receive range all the way from a simple ceramic tile installation to complete Marble setting in model high end homes. And Also Mosaic and its several types of applications. There are many reasons why choosing Zion Stone Marble, my company, is by far your very best choice. My company has served hundreds of homeowners and businesses in South Florida since the year 2000. You can rest assured that you will receive a service that has all the proper licenses. And also, our company is fully insured. Before we start any project, our insurance company will issue an insurance certificate to you. Our tile services are recommended by dozens and dozens of loyal clients. Our list of references includes clients in the entire South Florida. You see, Because of those wonderful compliments that I will work so hard to make sure every single detail of your project is taken care of, and then you will be 100% satisfied. And on top of that, we will never subcontract our projects. From the day we meet for a free estimate visit to the day your project is complete, it's Zion Stone and Marble that will be there. 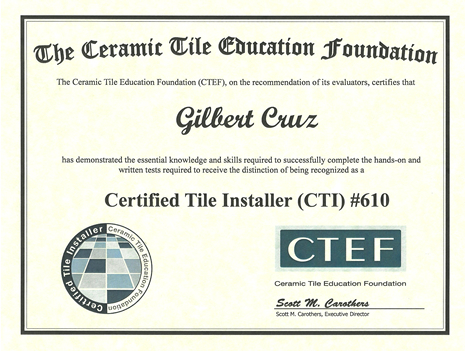 I am an expert author and I have written several articles on tile and marble in order to help my clients. And because experience is very important, You will have a professional responsible for your project with more than 10 years of experience setting tile and marble. And to make sure you have complete peace of mind, upon completion of your project you will receive an Warranty Certificate of your installation. And last but not least, I am proud that some of my work was once featured on the HGTV show. We will stop by your place, and take measurements, and also help you out with the types of tiles available and the advantages of some types versus others. I will follow up with a very detailed proposal along with a list of solid references emailed to you within 24 hours or less. We have experience remodeling bathrooms and any stone around a house, and we also have experience installing from scratch. That's why we're experts. Our quality services have given us the opportunities to lay stones in model homes in luxurious home associations and also high end hotels. We are Licensed (#10BS00149) and Insured. No job is too big or too small. Zion Stone & Marble, Corp. Copyright © 2000-2013 Zion Stone & Marble, Corp.